Studying birds that nest in grasslands on the firing ranges and runways of active military installations is not for the faint of heart, but it proved to be a successful strategy for solving some vexing migration mysteries. Fundamental questions regarding the timing and choice of migration routes, and what that means for conservation of grassland bird populations have been surprisingly difficult to answer—until now. A new paper published in Ecology and Evolution sheds light on the annual movements of two grassland bird species and yields surprising results that may help transform the way we manage grassland bird populations, both across international borders and throughout their annual cycle. "These results are a potential game changer for re-imagining conservation strategies for these grassland birds," explained Vermont Center for Ecostudies biologist Jason Hill. "Grassland bird management has been overwhelmingly focused on improving conditions on the breeding grounds. This is understandable especially for Grasshopper Sparrows, which are very hard to find outside of the breeding season when they're not singing. 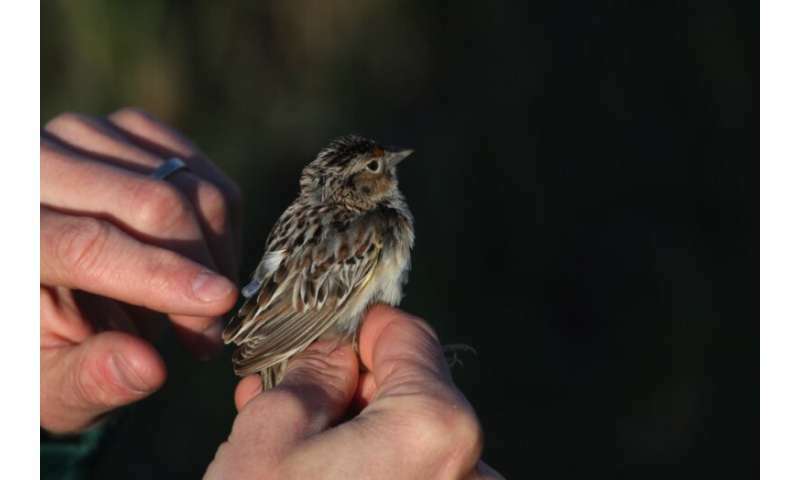 Our research reveals migration routes and specific wintering locations for several populations of Grasshopper Sparrows, and opens the door for a collaborative cross-border approach to managing them year-round." Some migratory grassland birds spend nearly half their lives away from their breeding grounds, yet we know relatively little about this part of their annual cycle. 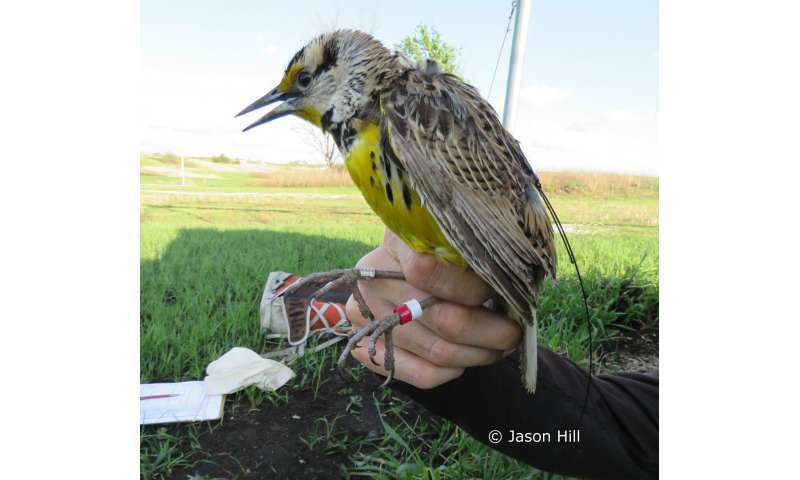 To investigate the migratory patterns of these two species, the biologists deployed geolocators on 180 Grasshopper Sparrows and 29 Eastern Meadowlarks at Konza Prairie in Kansas, and at six U.S. Department of Defense installations across the species' breeding ranges. They were able to retrieve location data on 34 Grasshopper Sparrows and five Eastern Meadowlarks. The study reveals where and when these grassland birds travel each year between their breeding seasons, but Hill says many questions remain. "The stopover ecology and nonbreeding habitat used by both species, especially for Grasshopper Sparrows in Mexico and the Caribbean Islands, should be a priority for future research." An airplane is probably not the only threat these birds face in their lifetime, and understanding what these migratory birds need when they're away from their breeding grounds will help us protect them all year long.